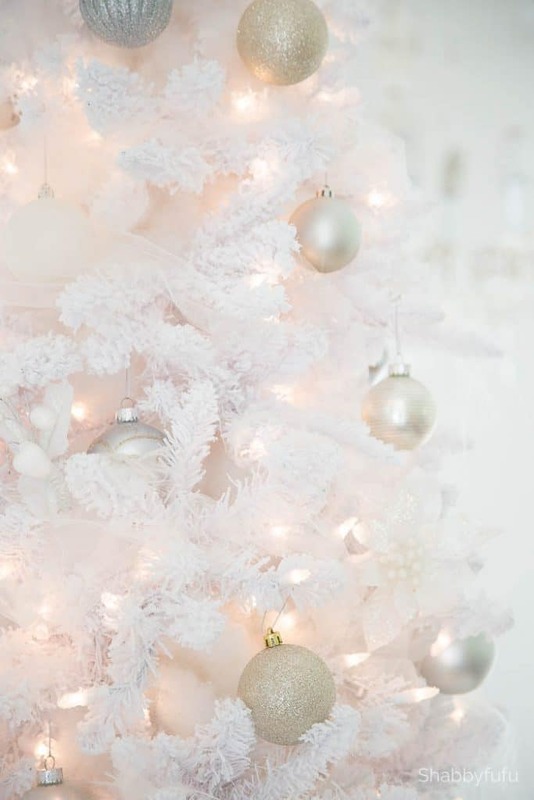 White Christmas tree pictures. 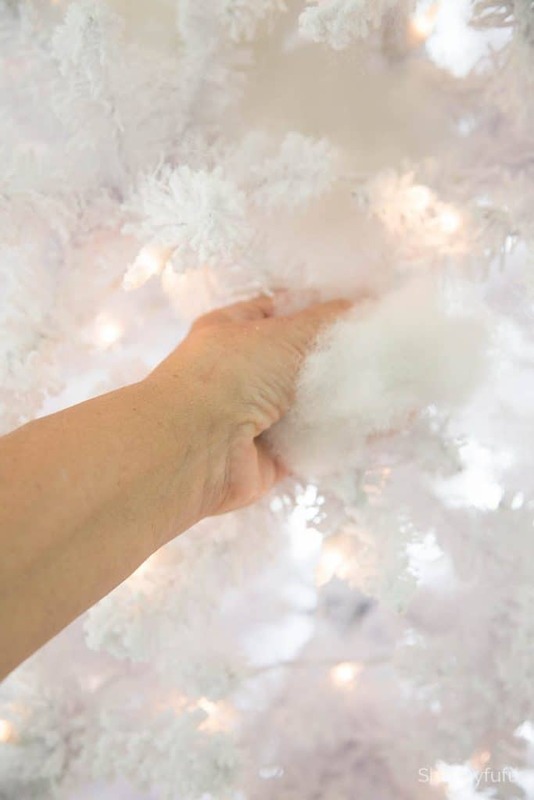 If you’re looking for them, this post is about WHITE CHRISTMAS TREES and how to take them beyond the way that they come to you in the box! 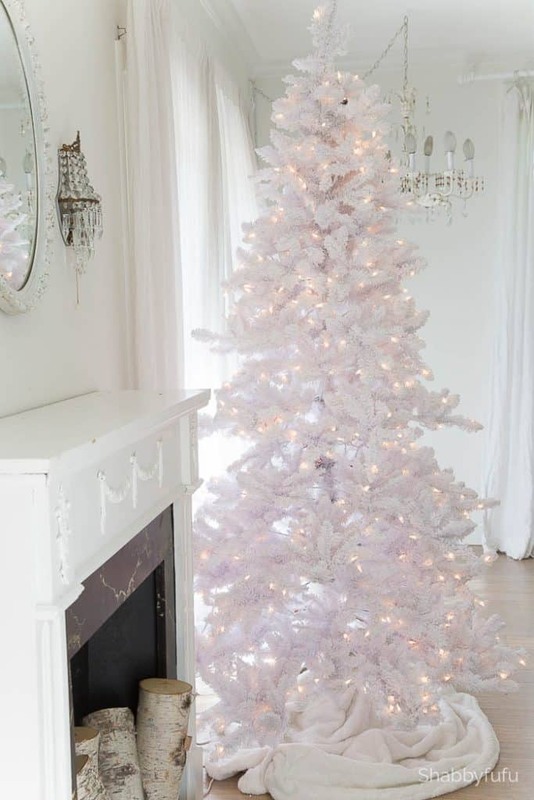 Take it and make it gorgeous with a few tips and go from the box variety to a WHITE CHRISTMAS TREE that has a LUSH LOOK! 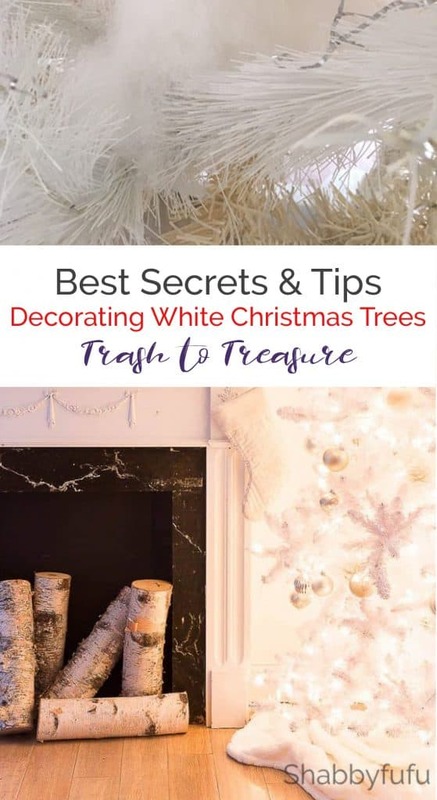 I’ve had several white Christmas trees over the years and generally speaking they don’t last more than a season or two and need to be replaced or reworked. I talked about some budget white Christmas tree decor in THIS POST from a couple of years ago, but that tree honestly had to go. The lights didn’t work (another garage humidity item) and it was time to do something new. 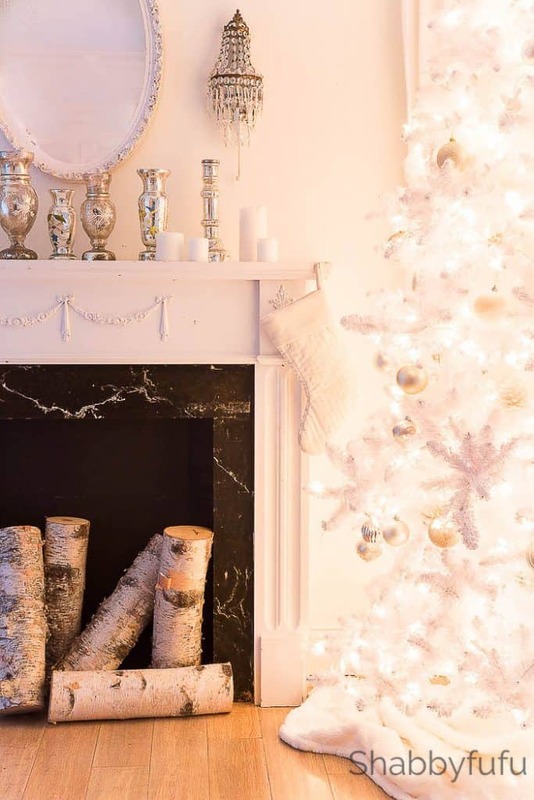 Presenting my new tree…from my friends at Tree Classics (above) and I’ll be sharing the full reveal of my French Country Christmas bedroom in a couple of weeks! I am pretty sure that this tree will last longer because it’s a WHITE FLOCKED TREE, and the flocking is nice and thick. The process that I used to fluff this tree is pretty similar to what I talked about HERE, but I have a few more tips today.Affiliate links provided for your convenience, click HERE for full disclosure. 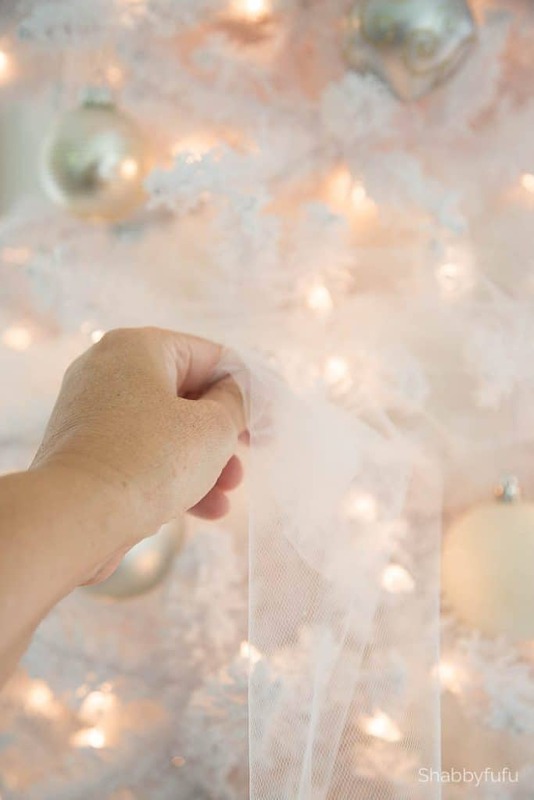 The first thing that you’ll want to do is to set up your new tree and fluff out the branches. It’s more tedious the very first time, and I like to store my trees in a tree bag and take off as little as possible to make next year easier! 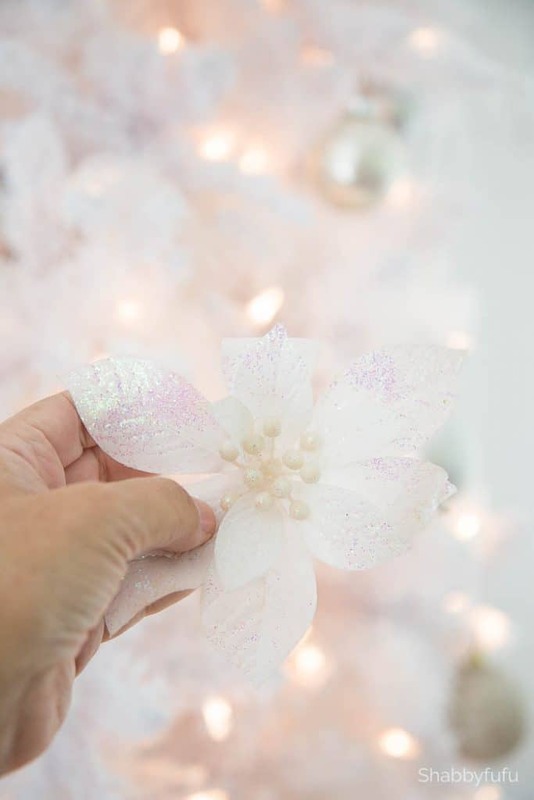 This tree is a WHITE FLOCKED CHRISTMAS TREE with LIGHTS. Now you can stuff your tree. 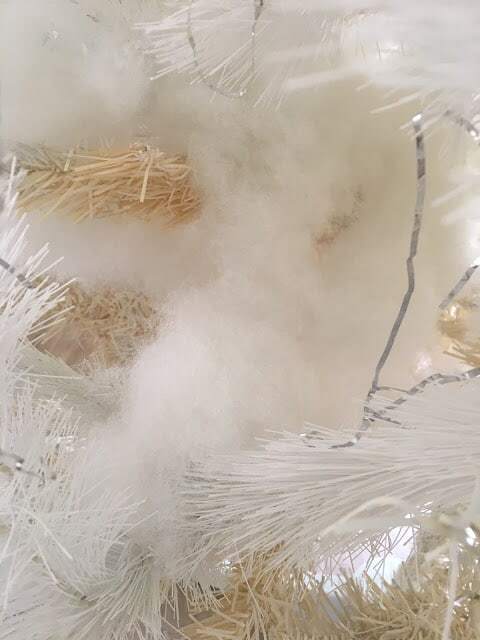 I used WHITE POLYFILL to stuff my tree and make it look like a tree that perhaps had been sitting in the forest during a heavy winter snowfall. 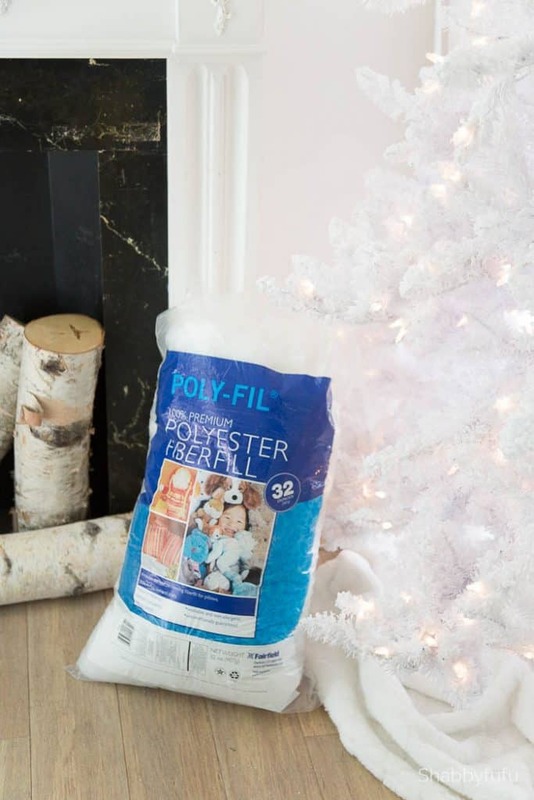 Take the polyfill and form it into snowball shapes and stuff it deep inside the tree to cover any of the stem or light connectors that show. Keep going back to observe where you want to stuff some more and add more wherever the tree looks bare. Next I added ornaments and in terms of WHITE CHRISTMAS TREE DECORATIONS I feel that white, silver and champagne suit me best without being too girly. Be sure to go around the tree and add with symmetry. 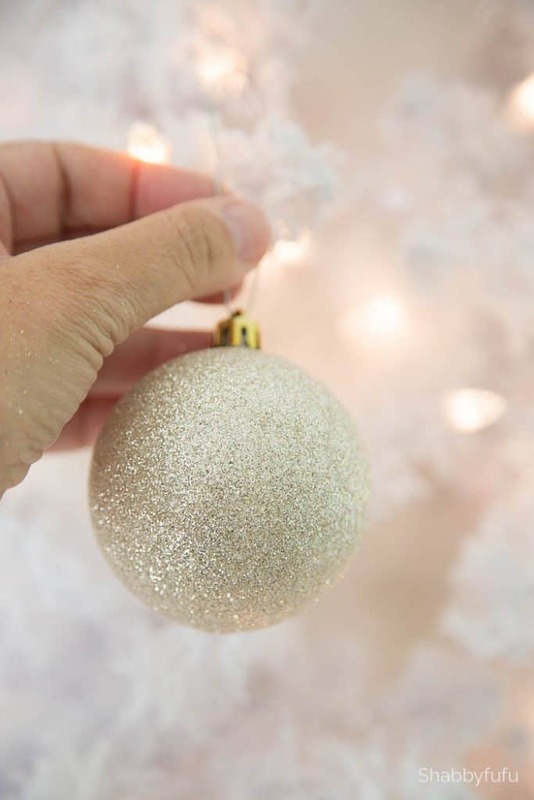 If the more TRADITIONAL CHRISTMAS TREE DECORATIONS suit your style they would look stunning on a white Christmas tree with lights, or my post COASTAL DECORATING FOR CHRISTMAS if you love pale blue. I used only what I had in my studio and found a roll of WHITE TULLE to use instead of ribbon for an ethereal look. 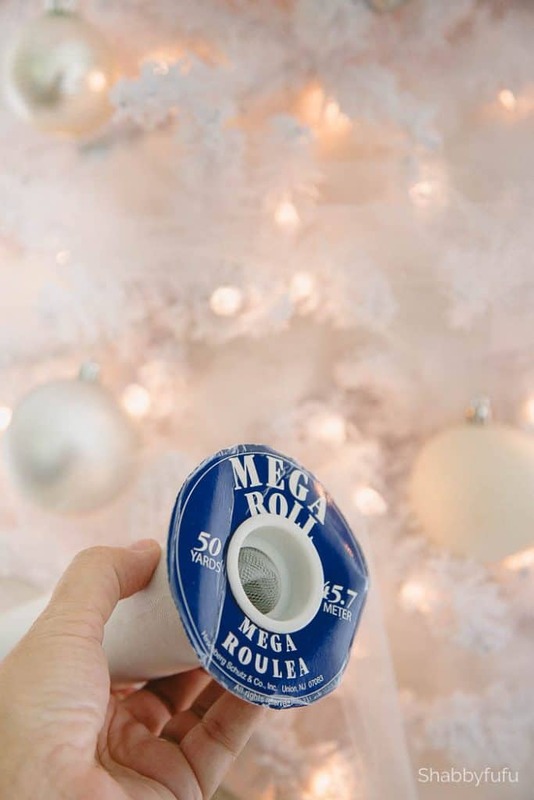 Wind it around your tree starting from top to bottom and leave it loose so that you can tuck in and play to see what looks best. 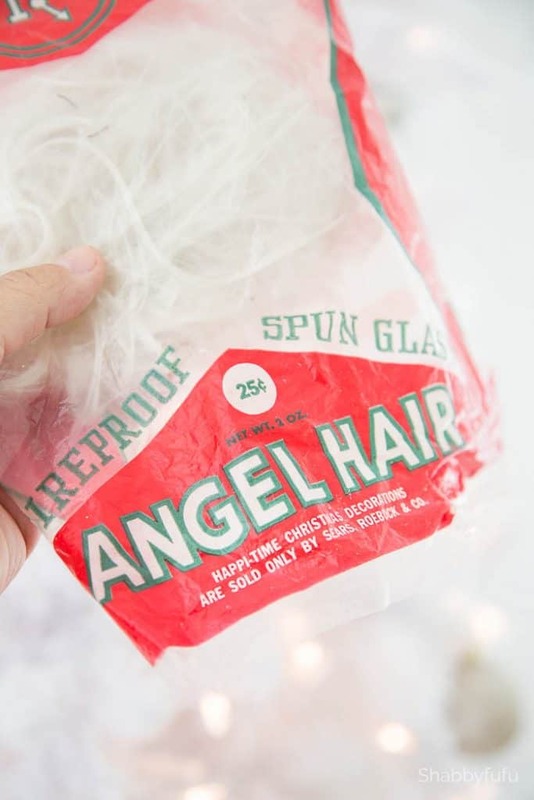 I went into my stash of vintage Christmas craft items and found some white vintage floral picks and vintage white angel hair, sometimes called SPUN GLASS. Not sure that I’m quite finished and may add a few white pinecones that I painted and talked about in this post about PAINTING PINECONES. You don’t need to use vintage Christmas decor items and can easily find new at the craft store, but I’m a VINTAGE LOVER and have these available to use. ***NOTE*** Do not leave your Christmas tree on for long periods of time if you are not in the area or not home. Although today’s trees are safe you don’t want to take the chance of electrical fires in the unlikely event something goes wrong. Add metallic ornaments (I used new shatterproof to avoid breakage). Wrap with rolled white tulle for an ethereal look. Embellish with picks, garlands, and textural objects such as white pinecones. It’s looking pretty magical in here and I cannot wait to share the full reveal of this room with you after Thanksgiving!